The character designs of Samantha Youssef certainly have a lot of charm and personality. But what really shines through is their construction. With each pose and gesture, you see her mastery of life drawing. In a time of heavily stylized characters, it is refreshing to see such fun designs that also happen to be grounded in some serious drawing skills. Whether it’s Bonnie and Clyde or Cleopatra, Samantha brings skill and grace to each creation. A graduate of Sheridan College, Samantha worked in the animation industry (including Disney) for years before founding Studio Technique in Montreal, Canada. In addition to animation freelance projects, she serves as Artistic Director for the studio and teaches life drawing and masterclasses to artists and animators from all over the world. You can check out her site for more examples of her amazing work and read more about the fascinating artist. It will make you want to practice your life drawing! 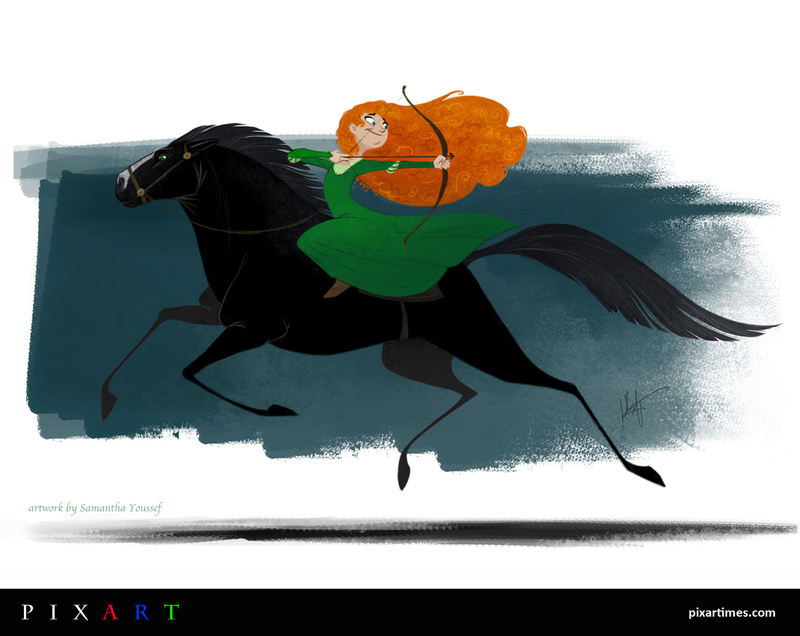 Our sincere thanks to Samantha for contributing this wonderful Merida piece, for which we are so grateful. You can take a closer look at it after the break! I feel I’ve been very fortunate in my life to have lived in many places around the world. There are several places that have been very important to me where I have close friends and family, so I don’t feel that there is one that I consider exclusively my home. The Incredibles. I love the design in that film and the story is great. I also really love Monsters Inc. and UP. I loved the visuals in Brave – I thought that was an artistically beautiful film. Pixar has created some great characters, so it’s hard to isolate one! I have favorites for different reasons. I love Russell, who is so endearing and genuine. I always liked Mirage in The Incredibles – I think she didn’t make the best choices to get to where she was, but when it came down to it in the end she did what was right, despite being someone who had no one in the story to support her. I loved the look of Brave, and I’ve always been drawn to animating female characters, so I felt like doing a piece with Merida. I wanted to have a simple graphic feel but maintain a sense of life and movement. People inspire me. I love sketching people and getting ideas from how people live. I love John Singer Sargent. His work breathes and is alive. It’s an intangible that he captures brilliantly that I am still trying to understand. Also, Robin Muller is a writer and illustrator who I have been fortunate to know who inspires me as an artist and a person. My own personal work is mostly on my blog, but I did start a tumblr and a twitter account recently.